The next generation of cars will need Bluetooth solutions that support multiple, simultaneous Bluetooth connections to different Bluetooth-enabled devices. The passenger might want to stream music from his or her device, while the driver might want to use his or her smart phone for hands-free telephony. In addition to the well-known Bluetooth use-cases hands-free telephony and music streaming, Bluetooth will be used to lock/unlock the car or to control an automatically parking car from a smart phone or a key fob. On motorcycles, a Bluetooth-enabled helmet will allow riders to communicate between themselves. 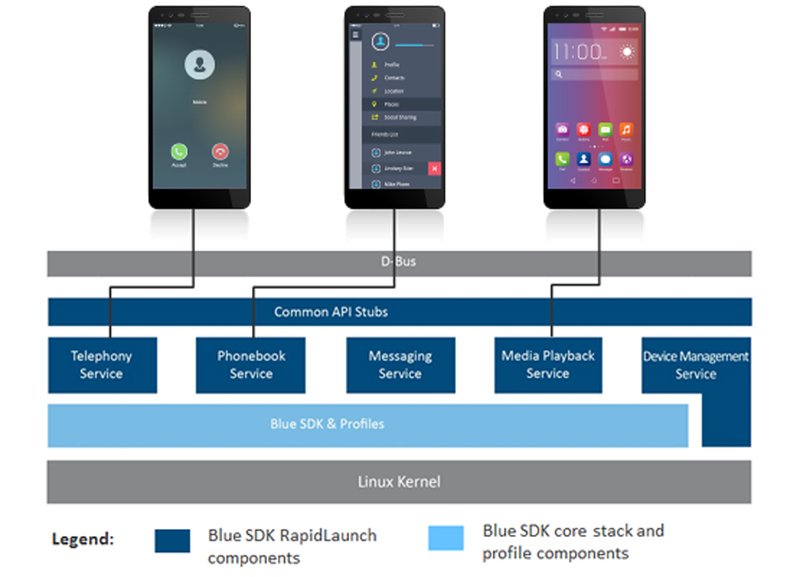 OpenSynergy’s Blue SDK is the right solution to build such systems as it enables multiple connections to multiple devices over multiple Bluetooth profiles, simultaneously. For example, when two drivers enter the car with their smartphones, both phones are automatically paired or connected to the in-vehicle head unit. Both smartphones within the car can run different activities via Bluetooth at the same time. For example, one can play audio streams while the other is downloading phone books. Blue SDK integrates all required profiles such as HFP (for hands-free telephony) or A2DP and AVCRP for media streaming. The upcoming systems will allow car configuration over Bluetooth Low Energy before pairing.